✔Capacity: fits under 14 inch laptop; A4 magazine&books,ipad, kindle or other essentials can be organized well in this backpack. The thick material,strong lining and good workmanship makes it not easy to be broken. Package Include: 1 Backpack + a removable and adjustable long shoulder strap. Durable shoulder straps are made of microfiber and canvas. 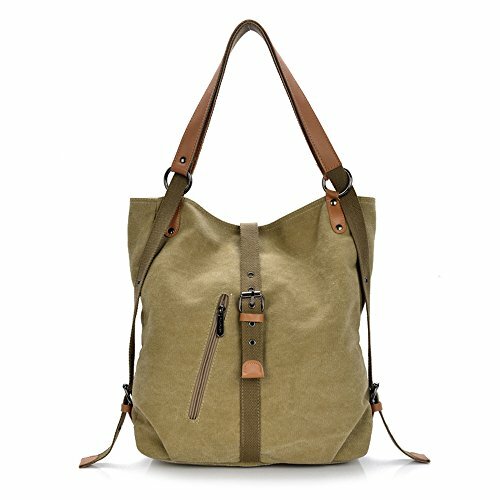 Multi-functional Canvas Bag - You can use this bag as backpack, tote bag or shoulder bag by adjusting shoulder strap in less than one minute; Stylish and convenient. Structure: External - zipper closure; There are one front zipper pocket for holding frequently used stuff. Internal - Hasp closure; Main Pocket, all stuff can be well organized inside. One compartment, two zipper pockets for secret stuff and one little pocket for smaller things such as wallet, passport, cellphone and power bank, etc..
Crossbody Bag Design - Made of High Density Canvas, Microfiber Leather Shoulder Strap and Bronze Hardware(fasteners, buckles and zipper pullers); Durable and fashionable. Rucksack Dimensions - 14.2 x 3.9 x 15 inches (L*W*H); Shoulder Strap 15 inches, Large capacity which can easily accommodate umbrellas, books, mini pad and so on. Multi Occasion: Our convertible bag, as a fantastic outfit,It can be used as a convertible backpack purse/ women shoulder bag/ travel bag/ ladies handbag, etc; Stylish and chic design goes well with any outfit in any occasion like work, business, dating, daily, travel, school and you will feel comfortable to carry it.